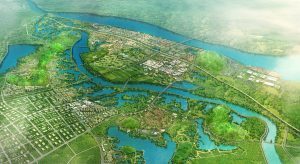 Both Smart City and Eco City are located within Wuhan’s Economic & Technological Development Zone (ETDZ) which is encompassing an area of more than 200 km² in the south-west of Wuhan Municipality. Wuhan ETDZ has been initiated and developed since the early 1990s. 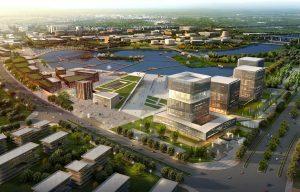 With an industrial output of 25 billion Euro in 2012 (roughly equaling that of whole Hungary), its economic strength ranks the first among all development zones in mid-west China. 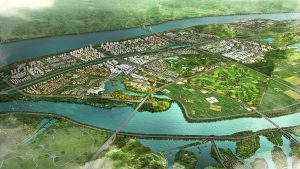 With its future developments, the new towns of Smart City and Eco City, it will host an attractive area for creating riverside city space, as well as the foothold of construction demonstration for the booming Smart City movement. 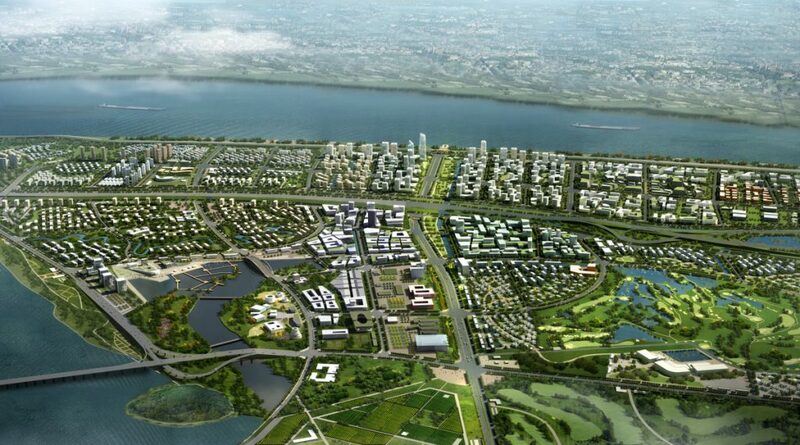 The attractive planning site with plenty of water resources spans between Yangtze River and Tongshun River. 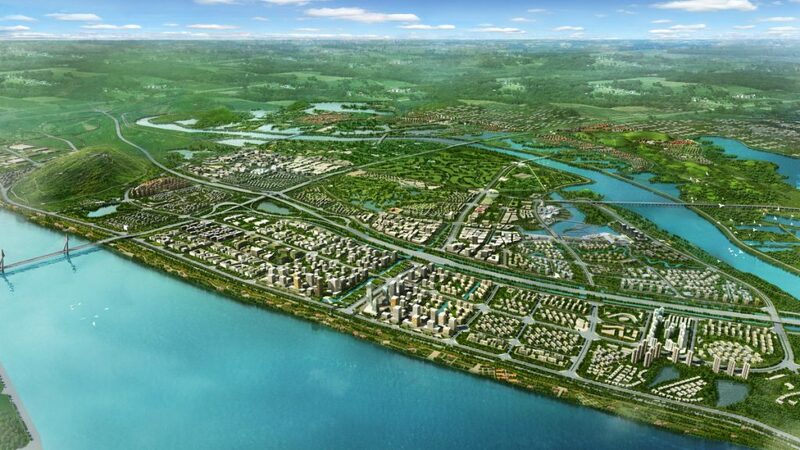 The Eco City is measuring 58.7 km², while the Smart City facing the west bank of Yangtze River is 26 km². The areas are characterized by a rich agricultural landscape formed by water ponds and an extensive network of canals and drainages. Wuhan ETDZ Planning Department, Pan-China Construction Group Co., Ltd.
Continue reading "Wuhan Smart City & Eco City"
Amidst a varied range of water bodies, the Smart City accompanies the Yangtze River bank, whereas the Eco City is located between the inner Dongjing River and Phoenix Road, a major city road leading to downtown Wuhan. 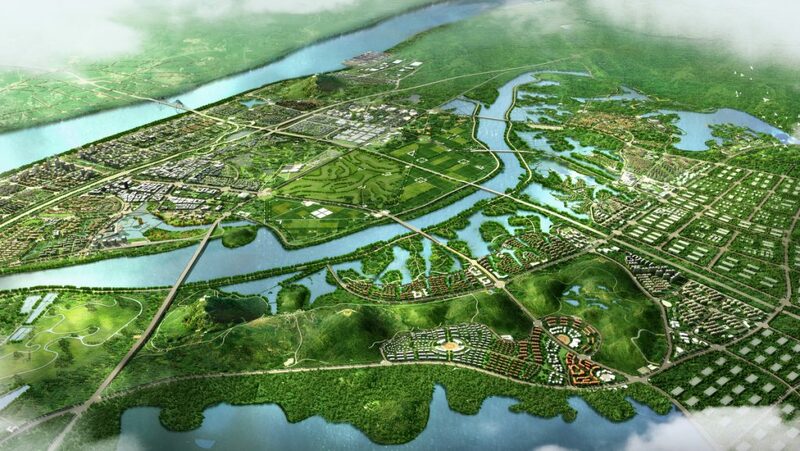 About ¾ of the overall planning area (84.7 km²) is made of abundant natural landscapes surrounding the two cities, composed of mountains, rivers, flood lands and artificial water ponds. 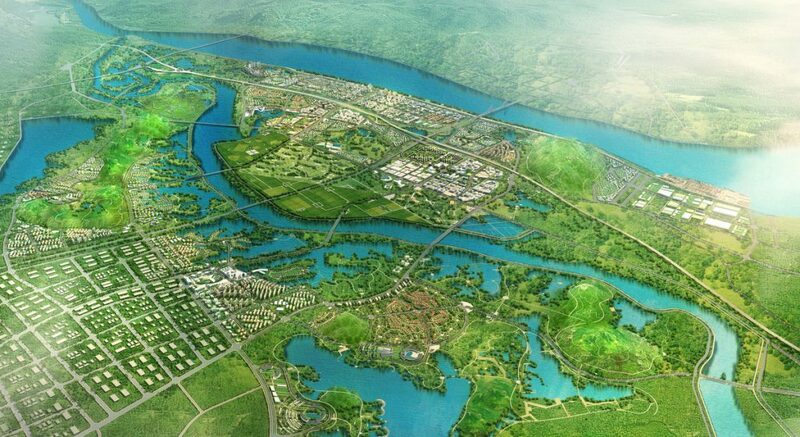 According to RhineScheme’s urban planning concept, both new towns are divided into themed districts with corresponding land uses. 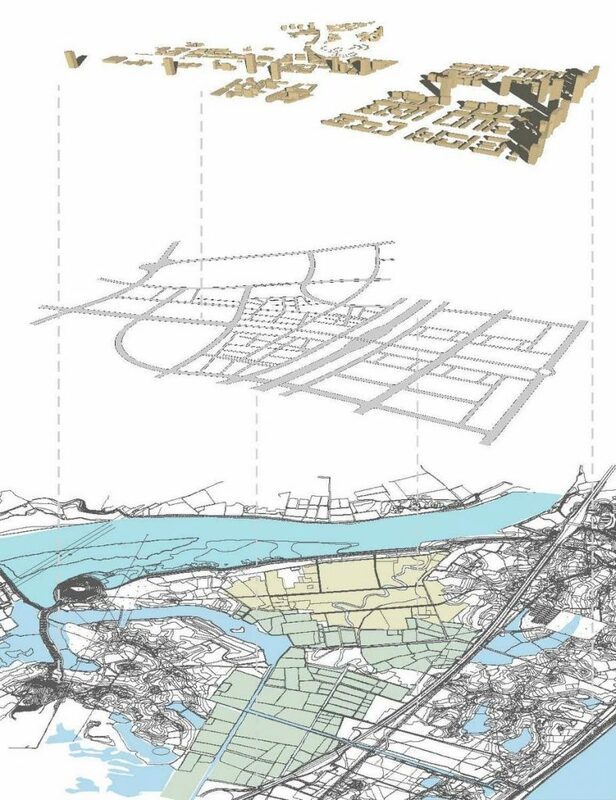 Within a coherent overall design, each of the districts receives its own architectural identity and individual urban structure based on its land use and theme. 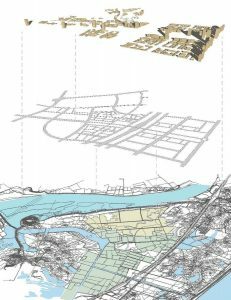 This is achieved through carefully knitting together the urban structure with the existing landscape and infrastructure, and by selecting appropriate architectural typologies and styles. 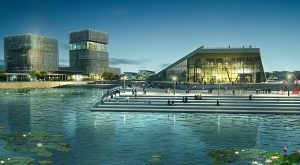 A new city district is going to be created in which advanced facilities and modern technologies provide energy-efficiency, environmental sustainability and – last not least – highest liveability. 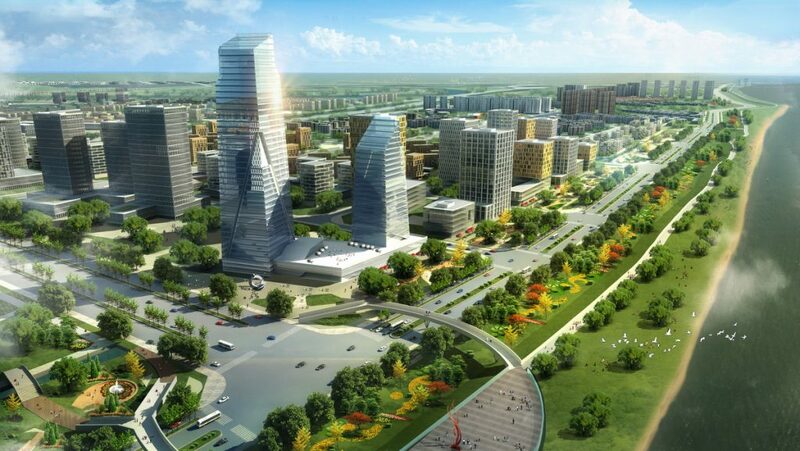 To realize the characteristics of “smart city” initially, connecting public city resources (water, power, oil, gas, mobility and public services) and to monitor, analyze and integrate various data in order to create intelligent living standards. 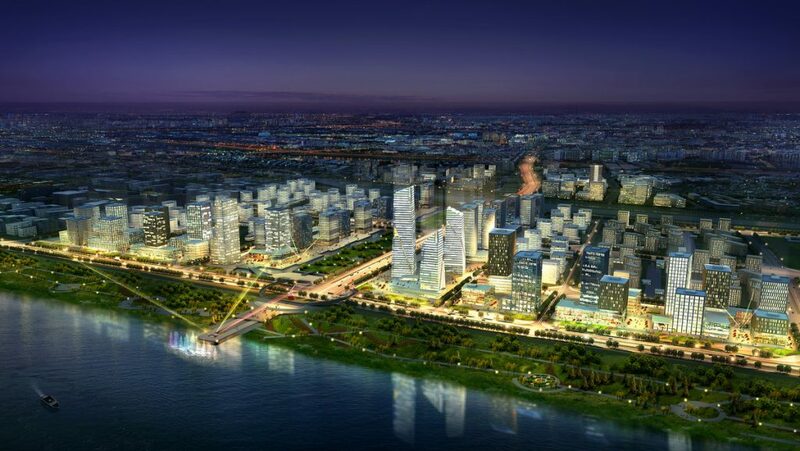 In general, the concept of ‘SMART City’ has been introduced as a strategic device to highlight the growing importance of social and environmental capital within a framework of Information and Communication Technologies, in profiling the competitiveness of cities. 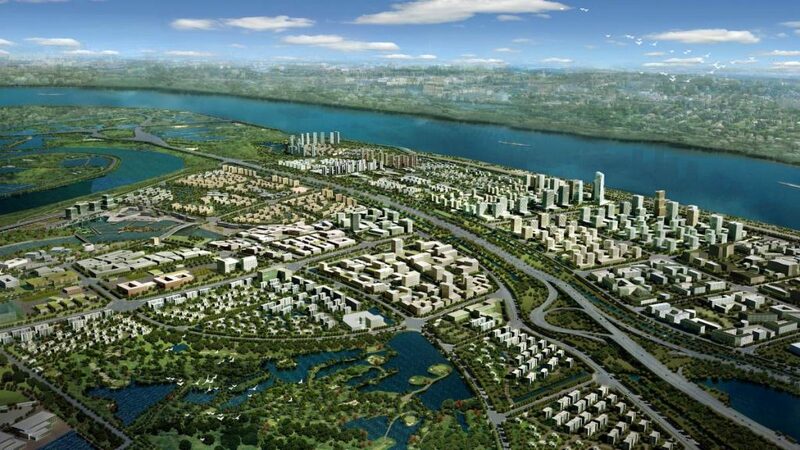 In particular, a city can be defined ‘SMART’ when investments in human and social capital, traditional transport and modern communication infrastructure fuel sustainable economic development and a high quality of life, with a wise management of natural resources. Create new spatial experiences and new fruitions founded on the idea of natural landscape and urban landscape. Facilitate the communication between people and nature. 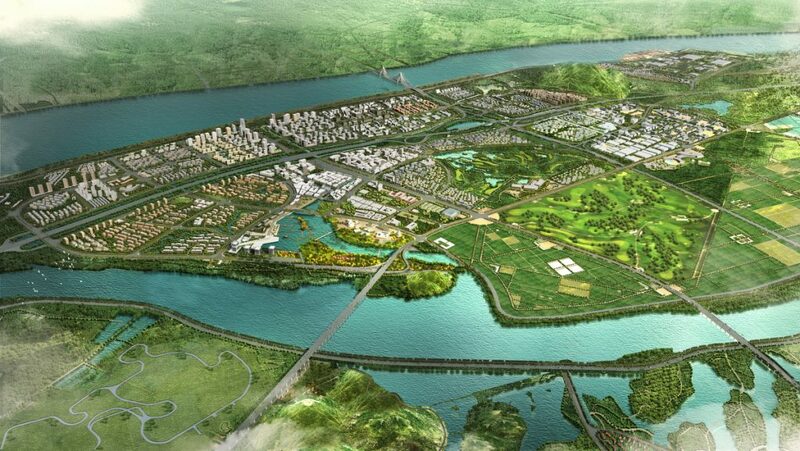 Set up a new model of economic district that relies on knowledge, tourism and education besides business. Propose a new traffic model that combines fast mobility with slow mobility. 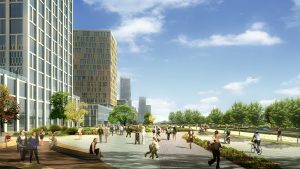 Define a new multifunctional ‘micro-centre’ that enables a lifestyle combining culture and education, living, working, leisure and sports at the same time. 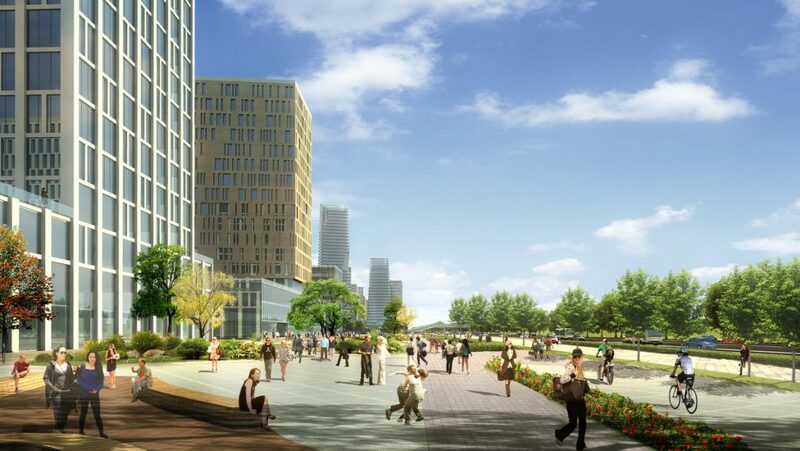 Create an urban space at human scale, rich of publicly accessible spaces and urban landmarks. Enhance the residents’/users’ feeling of identity and belonging to their place. Propose a new urban model for sustainable energy production and consumption. 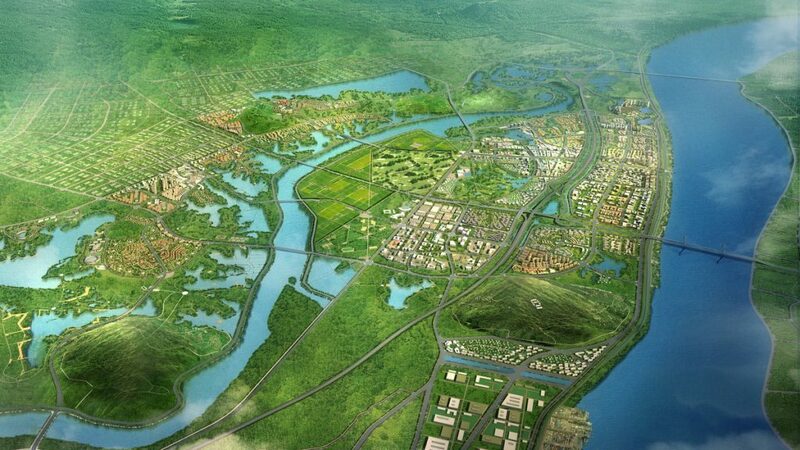 The predefined road network is connecting the North-Western wetlands and the Eco City to the Yangtze River in the South-East, crossing the Smart City. 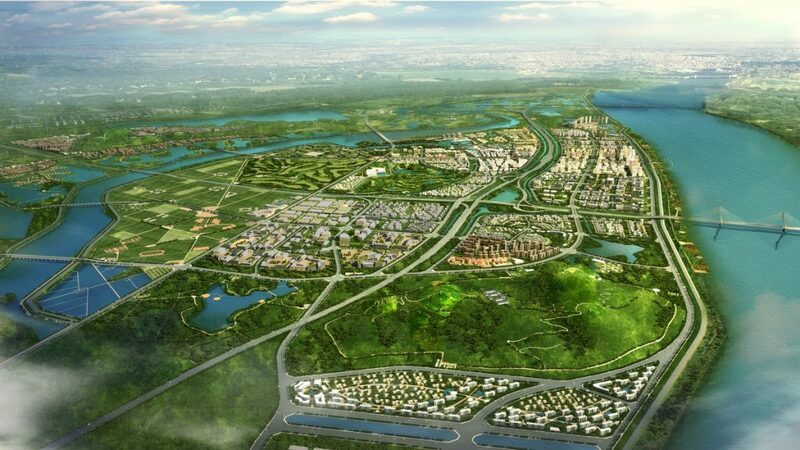 An essential and necessary consideration has been to create a new Green Corridor following the roads infrastructure and connecting the wetland system with the Yangtze River basin. 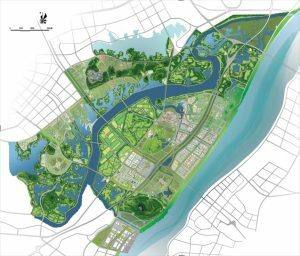 This Green Corridor is at the same time an environmental connection, sustaining biodiversity and ecological flows, and an infrastructural channel that reorganizes the main public systems: water drainage, public transportation, auto mobility, etc. Smart City is divided into 8 districts interconnected by a network of regional highways and major roads. These districts respond to the major connections with a protective wall of higher buildings both shielding the inner areas and creating an urban atmosphere along the roads. 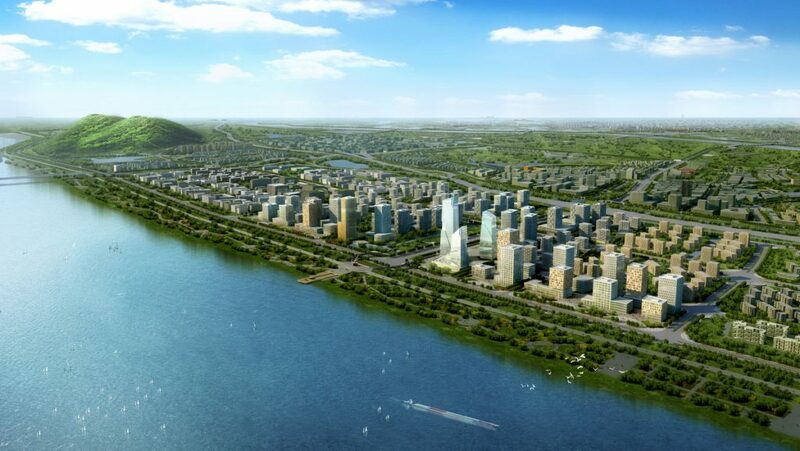 Towards the extensive water landscape and the Yangtze River front, the urban structure becomes dispersed and natural. The height of the buildings is reduced to minimize the visual impact on the landscape and to create a suburban appearance. From a functional aspect, the Smart City consists of administrative areas, a commercial core, some R&D areas housing innovative industries which are synonymous for the district, as well as some high-level housing areas. 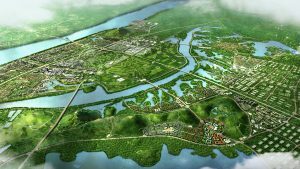 The Eco City consists mainly of residential areas with close connection to natural green areas. It is settled between an industrial district in the north and the winding waterscape of Dongjing River. Most of the public and commercial facilities are oriented towards Phoenix Road in order to provide a strong spine and main artery. Towards the river the building heights decrease, and the urban structure becomes less dense and plays with the existing boundaries of water and land. 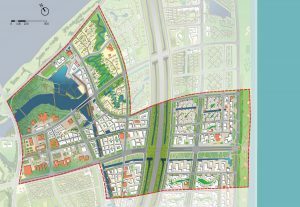 Strategically placed at the heart of the urban tissue, the Eco city core defines a town center and will provide services for the surrounding residential areas. 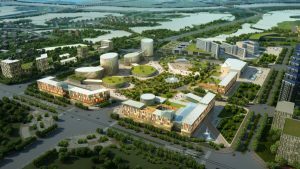 It will include the administrative headquarters of the Eco City and various public use functions such as cultural, hospitality and commercial facilities. 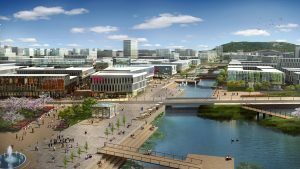 The design for the Smart City’s core area aims for an urban scale which is restrained in size and density; water and irrigation canals as structuring elements have been kept and re-used as landscape features for retail, working or living areas. 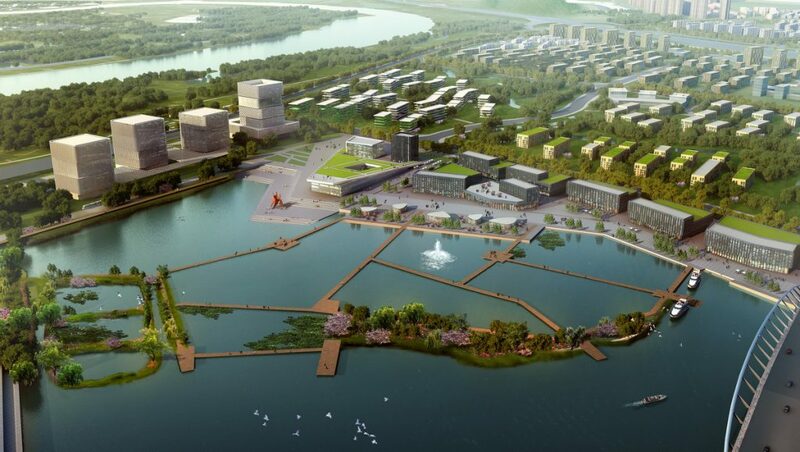 The district planning was deepened for an area of 4.78 km² strategically located to take maximum advantage of the most attractive features of the territory: On one hand it is surrounding an existing lake, offering a quiet and relaxed atmosphere, ideal for reconciliation with nature and for a realm of slowing-down. 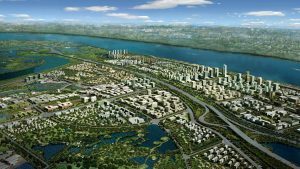 On the other hand it stretches towards the Yangtze River, showing a denser and taller built environment able to serve as business card of the whole development. 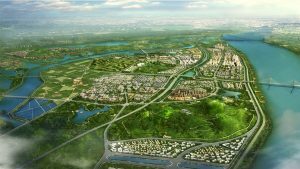 These apparently opposing functions are bound together by a Green Corridor running west to east, the ecological backbone of the Smart City and its main landscape feature. 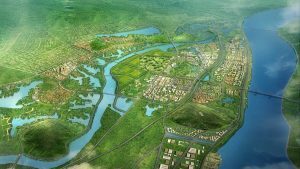 Key method and strategy was to re-use the existing land structure to a maximum, which follows a complex geometry of canals and water ponds, in order to minimize disruptions and to make the planning efficient in terms of time, subdivision of land, and construction costs. Main roads are therefore located on top of current banks dividing water ponds; existing canals are kept, improved and becoming elements of the landscape design; lower land areas of existing water ponds will become sunken courtyards or parking garages or other underground facilities, by that saving excavation costs. 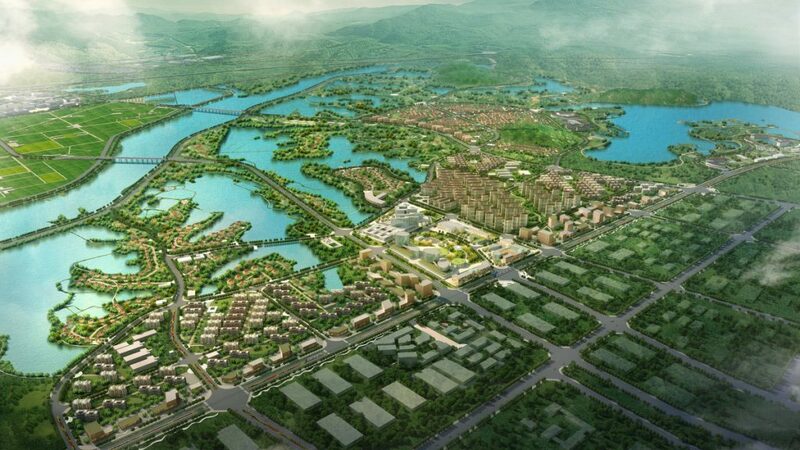 Moreover, the existing water system becomes the distinctive structure of the overall development, with intended reference and similarity to ancient Chinese water towns. Existing water ponds are re-used and revived in order to create a unique and contemporary waterscape, dedicated to people and leisure. 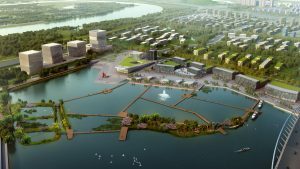 A Water Park is created around an existing lake, with a new and unique water experience, taking advantage of the existing water ponds, water streams and the prevailing topography. 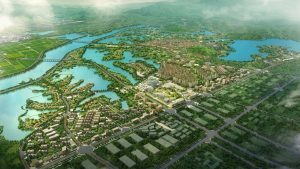 A new urban experience will emerge based on the found structure of ponds and canals, with urban surroundings facing the new water axis and benefitting from unique and inspiring landscape resources. Finally, a rich network of pedestrian connections and public transportation is designed around and across the whole area to facilitate an alternative mobility to replace or reduce private car traffic. 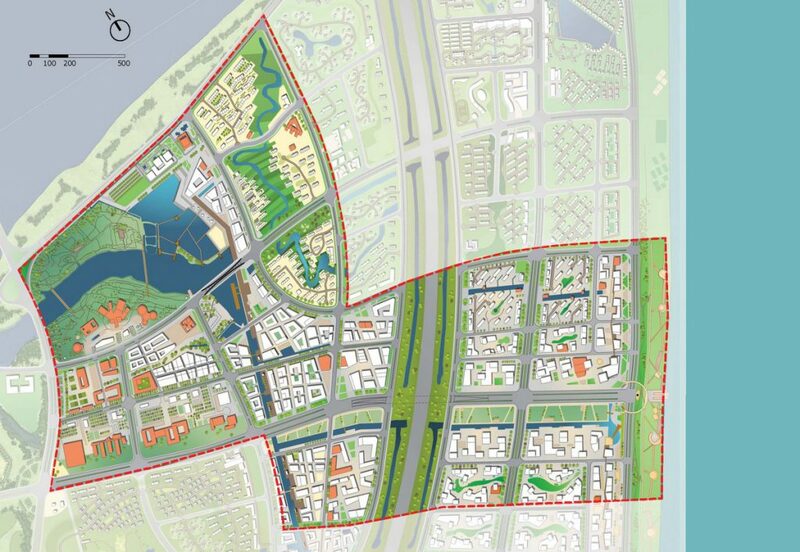 The Water Park / Smart Living / Public Service Area / Shopping Water Town & SOHO / Living & Working Water Town / The Green Corridor / The Yangtze Waterfront / Urban Mansions along the Canal / Residential SOHO. 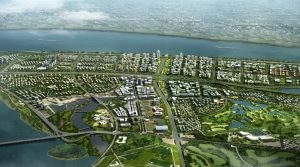 The start-up area measuring 1.65 km² and located around Chanjiang Lake will host the planning headquarters from which the city generates and also the first constructed area that will attract investors and future citizens. 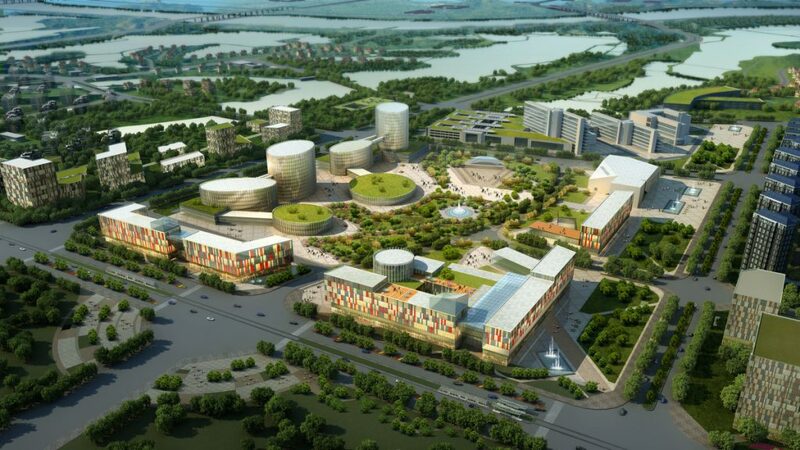 Both official and representative projects are placed here: The ‘Smart City Enterprise Centre’ will provide the necessary logistic support, while the ‘Smart City Exhibition Centre’ will host exhibitions and all kinds of information related to the planned city. A broader introduction to the envisioned cityscape will be given by samples of high-standard apartments and commercial areas that will be built there. 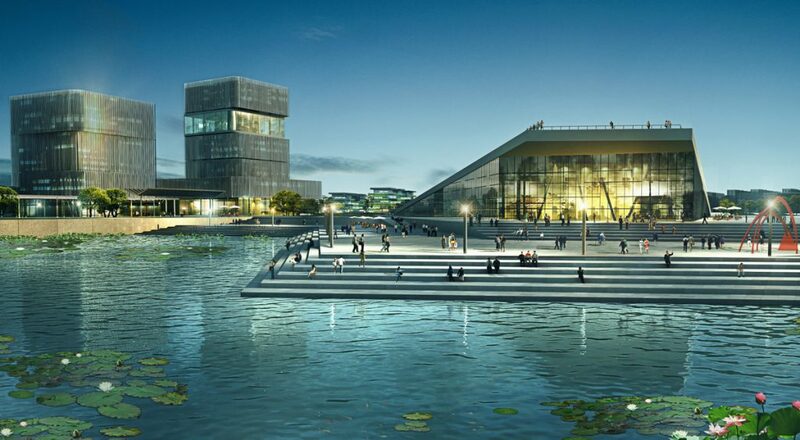 A cultural area is shaped on the south-west side of the lake, where a set of low-rise buildings, all with public functions such as museum and concert hall, will be integrated into the park’s landscape design. 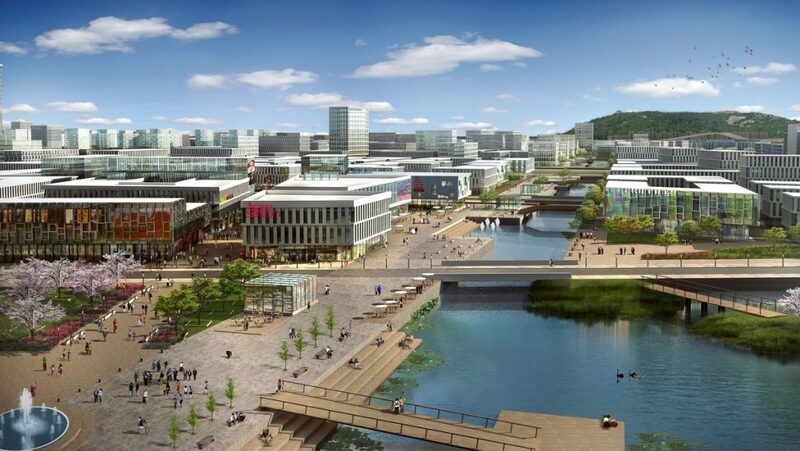 The very center is shaped by a low-rise shopping area, which will take advantage of existing water and canals to create a human-scale environment with car-free areas dedicated to leisure, restaurants and meeting places. Close to the highway crossing the plot in north-south direction, a modern SOHO development will show vibrant, dynamic facades to the cars passing by, benefitting from its good visibility. On the east side of the plot, the skyline will gradually rise both in height and density. Finally, by the river bank, a group of landscape office towers will create an image of modernity and efficiency, carefully balancing between the low scale of the smart city and the size required by the wide Yangtze river which they are facing and from which they will be seen.